This ebook contains a new, never before revealed technique that will catapult your website to the first page of Google searches in one simple step. This is Devin's most closely guarded web secret and he has used it in the past to get clients on the first page of Google when everything else failed. 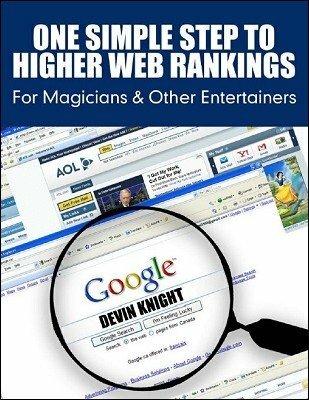 You will not find this method in mainstream SEO books, because this is a technique Devin Knight created called "Piggybacking" and it will get you on the first page of Google searches for performers in your area. In most cases, it will put you near the top of the page and over your competitors. The nice thing is that you can do this yourself without having to hire a web designer. You do not need to know anything about SEO (search engine optimization). Do this one simple step yourself and you will rank on Google's first page. In the past, Devin has charged clients up to $500 to use this secret technique. You do this without paying Google for Adwords. SEO firms charge anywhere from several hundred to several thousands dollars a month to get a business on the front page of a Google search. Now you can do it yourself with this easy to follow guide for less than a price of a night on the town.